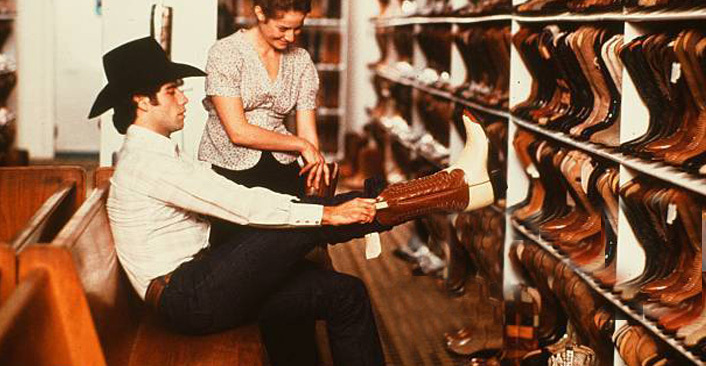 What do you think of when you think of cowboy boots? Do you think of the cowboy somewhere on the western range, sitting high up on his horse, wearing a dusty pair of brown leather boots made from the cattle that he’s driving across the plains? Or do you think of maybe a movie scene where someone comes walking through the door and the first thing the camera goes to is the slick pair of exotic cowboy boots that he’s wearing? You know the ones. They are shiny like snakeskin from a rattlesnake or python. They might even look like the skin from an alligator or lizard. There are a bunch of things men’s exotic skin cowboy boots can be constructed from. Either way, I bet those exotic boots come to mind once in a while when you think of cowboy boots. It’s hard not to. From the sound of them walking across a tile or wood floor to the unmistakable pattern of scales or skin, exotic cowboy boots always stand out in a crowd. Below I have put together a collection of 5 of some of my favorite exotic skin boots. One of them you might not think as being that exotic, but in the world of cowboy boots, cow leather is usually king. As always, let us know in the comments below if you have a favorite boot or skin that I didn’t mention here. 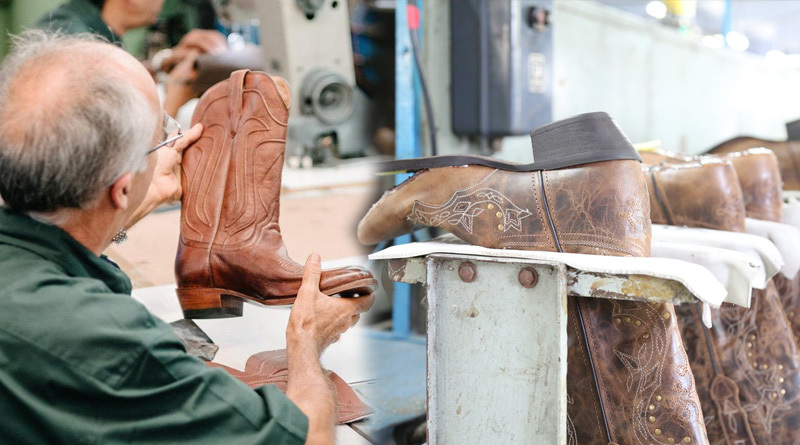 Due to many peoples / cowboys demand for a more decorative look and a higher end cowboy boot, this lead manufacturers to use a wide range of exotic skins along with the traditional cow leather in their boot lines. These high-end boots still retain the classic look but with a refined touch. Many different skins such as genuine ostrich, alligator, goat, lizard, snake, buffalo, and kangaroo are combined with traditional leather for a unique look that is sure to grab the attention of anyone in the room. Along with these superior skins, expert craftsmanship, and the implementation of more ornate designs these exotic skin cowboy boots have a look that’s a cut above the rest! *Side Note, I think most of these boots qualify for Free Shipping and the Quality is unmatched! The Sidewinder is the boot I mentioned above when I said that you might not think it’s exotic, but goat skin cowboy boots definitely fit the category of exotic skin cowboy boots. The Sidewinder also doesn’t play 2nd fiddle to other exotic skin cowboy boots in my opinion. Getting away from the traditional cow leather, goat skin cowboy boots are stunning! 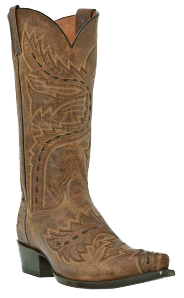 This boot boasts a 13″ shaft, cowboy heel, and a snip toe which I absolutely love! They also come fully leather lined with a leather out sole. They definitely hand comfort in mind including The Dan Post signature Ultimate Flex Insole in this beautiful boot. Three-part insole core gives flexibility to the ball of your foot and stability in the heel and arch. Patented Poron® system has microbial features to reduce foot odor (your friends or significant other will thank you) and reduces step shock (returning energy to your foot). Lizard skin is a great material to use for your exotic skin cowboy boot. Why is this you ask? Well besides the durability, they also come in a bunches of different colors and their patterns are also very distinctive. 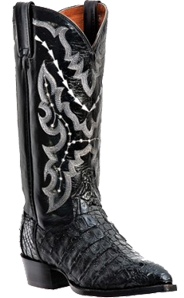 Another great reason is that lizard skin boots can be allot cheaper than say alligator or snake skin boots. 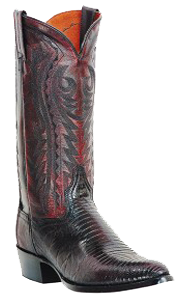 The Dan Post boot pictured here is a beautiful black cherry lizard skin cowboy boot with a round toe and a cowboy heel. They are absolutely magnificent! These boots are made from the Teju lizard which comes from the southern portions of South Africa. The Teju has small squares that are almost square shaped with larger scales on their belly. Like a python, the Teju’s skin can have irregular and magnificent color patterns depending on their sub-species! Because of this, lizard skin can be some of the most exotic skin cowboy boots on the market! The Raleigh features a 13-inch leather shafts and is fully leather lined and an “Ultimate Flex” insole. Dan Post’s “Ultimate Flex” insole gives your feet comfort with every step. The Birmingham’s from Dan Post are an exquisite men’s exotic skin boot that is definitely one of the most popular types of boot when it comes to exotic animal skin boots. Caimans are a very close relative to crocodiles and alligators found in Central and South America. The caiman is one of the boniness skin when compared to alligator and crocodile skin, so this gives it very deep and distinctive ridges. They definitely stand out when compared to other cowboy boots. Also, caiman have very calcium rich deposits in their hide which give it a patterned effect that can last through the dyeing process. This can give Caiman hide boots a very distinctive look that you just can’t find in alligator or crocodile. Another great benefit with Caiman is they are more prevalent than alligator or Nile crocodiles. This makes them generally less expensive. Hey, you can often get a more distinctive and detailed look with caiman at a cheaper price when it comes to exotic skin cowboy boots. Sign me up! The Birmingham has an eye-catching 13-inch genuine leather shafts and is fully leather lined with a rounded cushion insole. They sport a rounded toe and a cowboy heel. Ostrich skin cowboy boots, hmmm? I was a little confused at first. I actually thought they plucked an ostrich and then used their skin or something. Wrong answer! The Bellevue is made from authentic ostrich leg skins and is broken in from day one. Ostrich skin is known for its unique texture. It’s very hard to mistaken for any other kind of boot. They have a brilliant glazed shine and there are a wide variety of colors to choose from. You won’t find quality ostrich boots everywhere, but Dan Post has definitely outdone there self with the Bellevue exotic skin ostrich boots. These Black Cherry boots sport and round toe with a cowboy heel. They are leather lined and feature the “Ultimate Flex Insole” for a super comfortable pair of men’s ostrich skin cowboy boots. Features a 13-inch medium dip genuine leather shafts and a full leather lining. 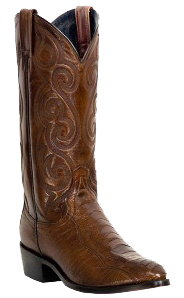 Dan Post has created another beautiful genuine flank caiman exotic skin cowboy boot that is sure to turn heads! These boots are broken in from day one. The Denver sports an 11-inch genuine leather shafts and is fully leather lined with an Ultimate Gel-Flex insoles for, maximum comfort. Unlike the other boots above, the Denver has a broad squared toe, a Cowboy Certified out sole, and a Stockman heel, which is a shorter and wider heel. 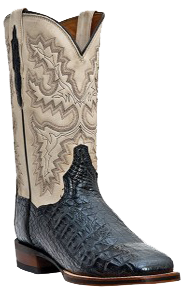 As I stated above when talking about the Birmingham, caiman is a great skin to use in an exotic skin cowboy boot. It has very deep and distinctive ridges and can come in some beautiful colors and be very detailed due to their bony skin and detailed pattern effect. Exotic Cowboy Boots – Beautiful, Affordable, Game Changers! 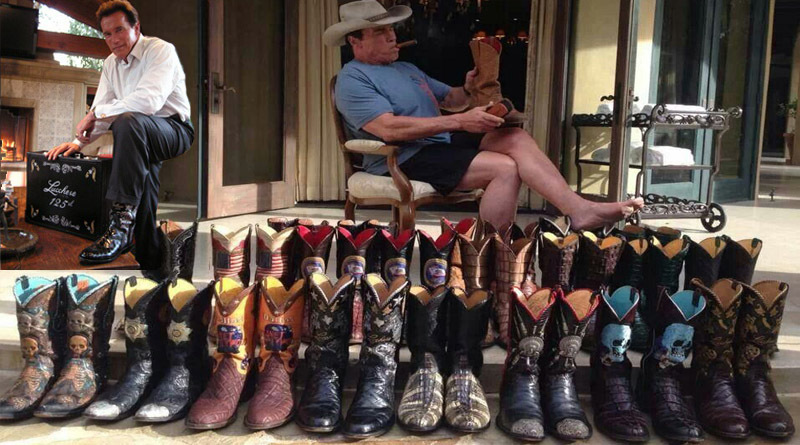 Well as you can see, these are some beautiful cowboy boots. No matter which type of exotic skin boots you decide upon, i.e. alligator, lizard, goat, ostrich, or another type, I’m sure you will love them! You will definitely be in for an adventure, because they sure will get you a ton of attention. Exotic skin men’s cowboy boots have come a long way since the day of rounding up a herd of cattle on the open trail. Exotic skin cowboy boots have definitely made their impact not only on stage and screen, but in every day life when the average person, not only wants to feel a little special, but also look pretty damn good! They are definitely a fashion statement and I really don’t think everyone is meant to wear them. But I think if you have the desire in your heart to wear a pair of these beautiful boots, I’m sure you will love every step that you take in them.